I’m not a fan of shopping, even for a pair of jeans. I especially hate that uncomfortable feeling you get when you walk into a shop and can feel the hawk-like gaze of the shop assistant fall on you and stay watching you. Try as you might to avoid eye contact, you know they are going to eventually come over and try to sell you something, and even though you are there to buy, that kind of pressure to make decisions just isn’t necessary. The car salesman has become a stereotypical comedic reference, used in a number of films and tv shows as the sleaziest guy possible, doing his best to rip you off. As with all stereotypes, this isn’t necessarily true of the real people behind the profession but there is some definite truth to it. 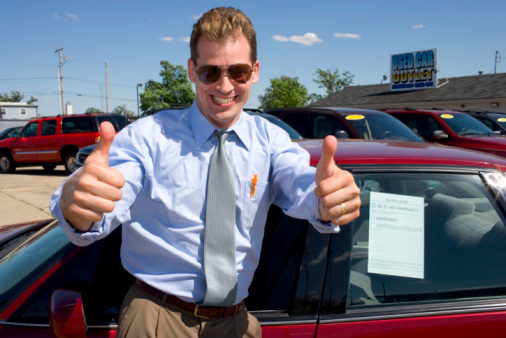 The slick hair and the cheesy smile seem to be taught at car salesman school. It’s also interesting to note that it seems to be a very male dominated industry. I don’t feel the need to write salesperson rather than salesman because I have never actually come across a female at a dealership. Perhaps there’s something to that. Either way, I recommend steering clear of car dealerships, if for nothing else than to save yourself money. These days, as with everything from dating to grocery shopping, it is extremely easy to buy a new car online. If you haven’t already heard of it, check out Cars and Co. It makes sense that you will save money this way; there are no salesman wages and commissions to pay, or dealership rental spaces, so the savings filter down to the customer. Despite how brilliant the internet is, it can also be overwhelming. There is so much information out there, that it’s easy to get buried and overwhelmed. Try to decide on what car you want, at least the basics before you start looking around. Some sites offer market comparisons to save you the time of sifting through dozens of different websites. This can be a good place to see what prices are being offered to differing makes and models. But remember that when buying a new car there is always room to haggle, so do your best to sweeten the deal. Online classifieds such as Car Sales do a similar thing and compare prices of cars from dealerships all over your area. Just remember that these sites have to make money to operate and so the cars at the top of the list aren’t necessarily the best deals. You can also do much of the wheeling and dealing over the phone if you’re up for a chat. If you need financing, then you can set that up over the phone as well, or there’s always your bank which will most likely be more than happy to lend you money. That way you can avoid the dealership financiers if you don’t trust them either. If you’ve decided on a car but still want to be sure, don’t be shy about visiting a dealership for a test drive. Yes, this article is about avoiding dealerships and now I’m saying maybe drop into a dealership, but there is a freedom that comes with visiting a one to test drive a car without any intention of buying from them. Of course, you can skip this step, but it can be important to still allow yourself that chance to get to know the car and whether you think it really suits you. Sometimes what seems like the perfect fit isn’t quite right after all. Deciding on the right car isn’t easy so save yourself the days spent driving from one dealer to the next and do it all from home with a glass of wine (if it’s after midday).